Baliga's invention has resulted in cost savings of over $15 trillion for consumers. "Because of the IGBT the world has not had to build at least 600 hydroelectric dams of the size [of the] Hoover Dam!" This reduces heat dissipation, which reduces the size and cost of the electronics. This also reduces electricity consumption, saving consumers money and reducing environmental pollution. As a child, everyone has a favourite boast about their daddy. But few would have a story to match Prof Jayant Baliga's. "The first TV broadcast into a home in India occurred in my house." In true tradition of a man of science this isn’t an empty boast. It really did happen. "My father, BV Baliga, was chief engineer of All India Radio after Independence. There was an exhibition in Delhi in the 1950s where they were using the All India Radio's setup of a camera and a transmitter to show a TV telecast within the exhibition premises. My father wanted to test if the signal could be received at a farther distance." He had a television set installed at his house at Teen Murti Marg. "It caused quite a sensation in the neighbourhood," says Baliga. BV Baliga went on to head Bharat Electronics Limited, the heavyweight electronics public sector undertaking. One might have expected Jayant to go firmly towards the future then: Computers. Instead, he invented something that joined two sister disciplines: Electronics engineering and electrical engineering. That device was the IGBT (Insulated Gate Bipolar Transistor), a switch just like the ones in any house. It is just that the one Baliga invented is super-small, can switch on and off 100,000 times a second and handle really high voltage power. Baliga's invention has resulted in cost savings of over $15 trillion for consumers. "Because of the IGBT the world has not had to build at least 600 hydroelectric dams of the size [of the] Hoover Dam!" says Baliga. Today, his invention is forming the basis of the emerging smart grid. These electrical supply networks of the future will replaces large and less efficient components with small, cheap and efficient semiconductor equivalent. One emerging device that is holding out great hope is the transformer-on-a-chip. All of us have seen the large distribution transformers in our neighbourhood. Imagine that being replaced by something that is many times smaller! It was the late 1970s and Baliga was heading a team of 40 scientists that was working on power semiconductor devices and high voltage integrated circuits at General Electric's Research and Development Center in Schenectady, New York. By then, the transistor—the device that makes computers possible—had been discovered and commercialised. Since Baliga was at GE, he focussed on a complementary area. He tried to develop a semiconductor device that could control equipment like compact fluorescent lights, airconditioners and electrical motors. Essentially, the heavy duty stuff. All these applications need power electronic circuits that operate at high efficiency continuously. This reduces heat dissipation, which reduces the size and cost of the electronics. This also reduces electricity consumption, saving consumers money and reducing environmental pollution. At that time, companies like GE and Westinghouse were developing their bipolar transistors for high-power devices, while another group led by Siliconix and International Rectifier was developing another type of transistor called the power MOSFET. The feeling in the industry was that the two technologies were incompatible because of different manufacturing practices and end customers. It was Baliga who thought of combining the physics of the two. "There was a vice-president in GE who was developing a heat-pump for air-conditioning applications. He was frustrated that the exiting transistors were failing and that the circuit needed to drive the motor pump was too big, expensive, and very cumbersome to assemble," says Baliga, who had already been working for five years in this area. He rose to the challenge and created a mechanism by which the power surges did not blow out the transistor he had developed. "It is a research that requires not only knowledge and creativity, but also perseverance. Jay [Baliga] exhibited all of these attributes. With his detailed knowledge of silicon fabrication methods and these transistor devices, he invented the IGBT," says Jim Bray, chief scientist, Electrical Technologies and Systems, GE Global Research. The device was considered such a breakthrough for GE that Baliga personally briefed Jack Welch. "It wasn't a very usual practice for a scientist to brief the chairman. He came down from Connecticut to Schenectady," says Baliga. Welch decided that the discovery should be kept a secret. "I wanted to publish about the invention, but that was embargoed for several years. But GE also rewarded me by making me a Coolidge fellow, the youngest ever in the history of GE," says Baliga. 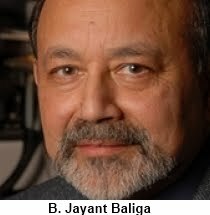 The extent of Baliga's contribution to the world and the US Economy was recognised in 2011 when US President Barack Obama presented him with the National Medal of Technology and Innovation. This is the highest form of recognition given by the US government to an engineer. After that, while Baliga remained in academia, he also founded three companies between 1999 and 2011 to commercialise various semiconductor technologies. Unfortunately, his association with India, which was fairly high in the 1980s, has declined. "In the 1980s and 1990s, I was visiting India every two years and would make the effort to meet with scientists at universities and government organisations (BEL, BHEL). During my biennial visits, I gave lectures at BEL, BHEL, CEERI-Pilani, IISc-Bangalore, and IIT-Madras. At the present time, I am not connected to any Indian science fraternity," he says. One issue that has held him back is perhaps the lack of progress in India in semiconductor technology. And developing this does require a huge amount of capital investment. "My impression is that it would be very difficult to develop the types of semiconductor chips that I work on in India due to lack of infrastructure," says Baliga.